68 pounds 8 ounces is what this beauty weighed. 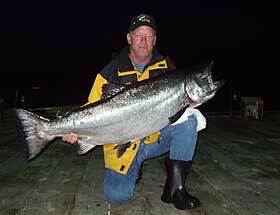 David Farrelly won a free trip back to Black Gold Lodge in 2006 with this, the largest Chinook of the season. This Chinook was the Largest Landed in Rivers Inlet in 2005, also winning David the Rivers Inlet North Coast Salmon Enhancement Derby's Largest Chinook Prize.